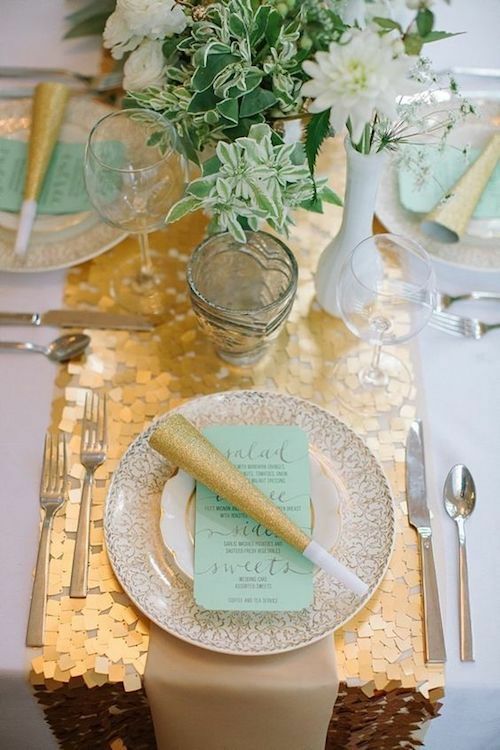 We rounded up a collection of 31 jaw-dropping table runner ideas for your wedding reception. And we guarantee #7 will make you smile. But will also cover the table runner’s length for formal, informal, round, square and long tables. Let’s get to it! We’ve got a lot of ground to cover! 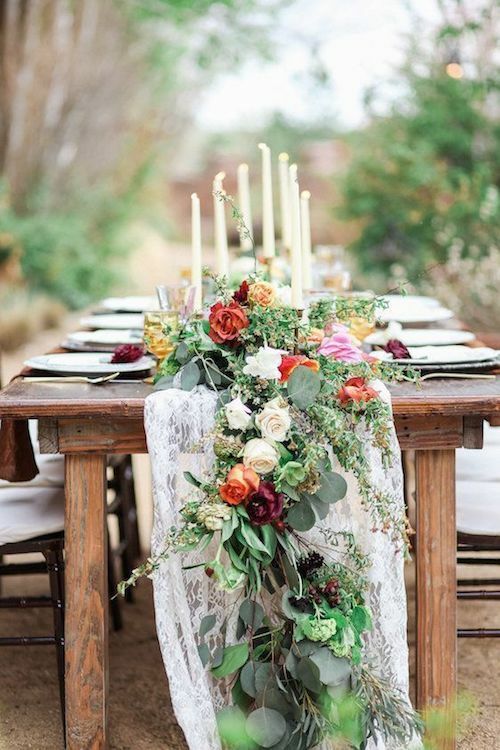 Stunning luxury wedding with velvet navy table runner, gold flatware, blush and burgundy florals by Sage Nines. 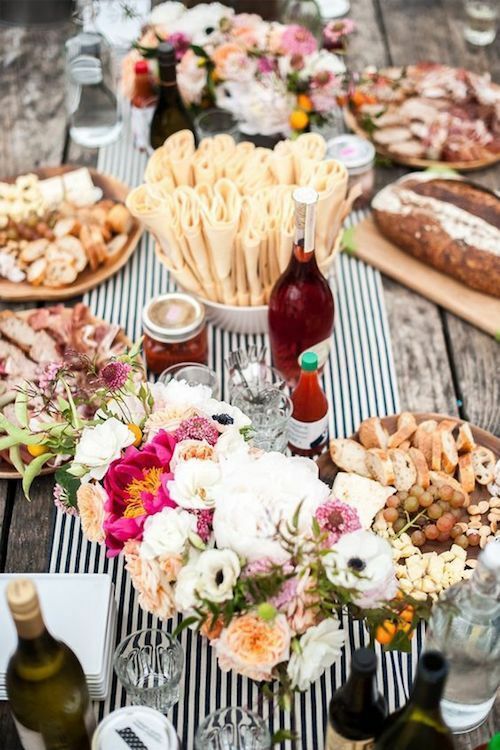 Here are 31 incredible table runner ideas anybody can diy and use at their wedding reception. From sequins, to lace, flower garlands, black and white photos and a few tips that can help you truly impress your guests. 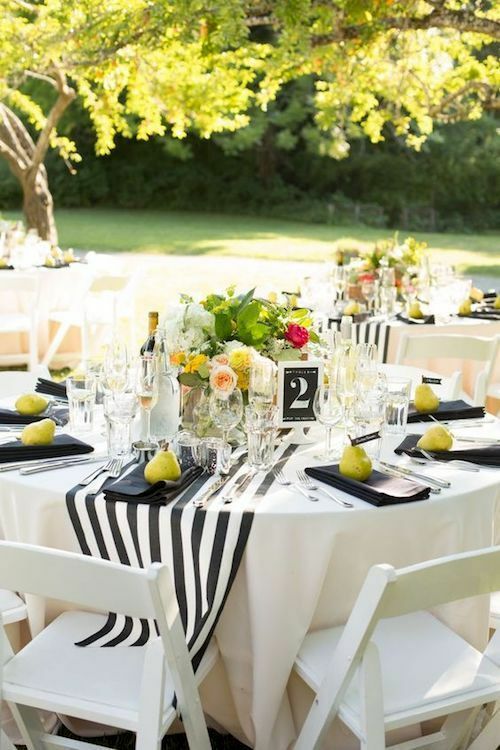 Standard table linens can be so blah! Same color, same texture. We need something to liven them up. 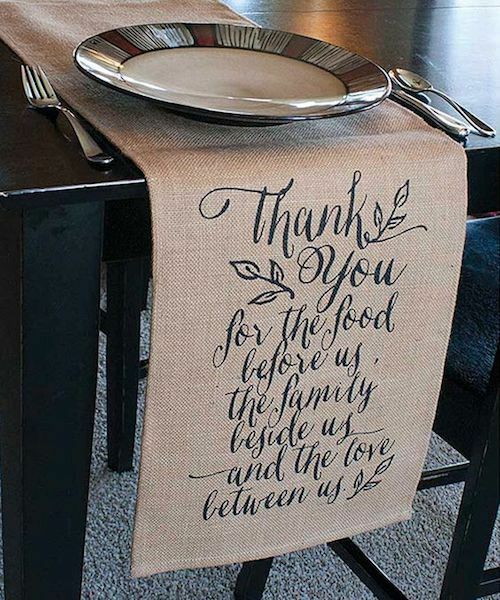 To stand out, table runners should never be identical to the tablecloth. 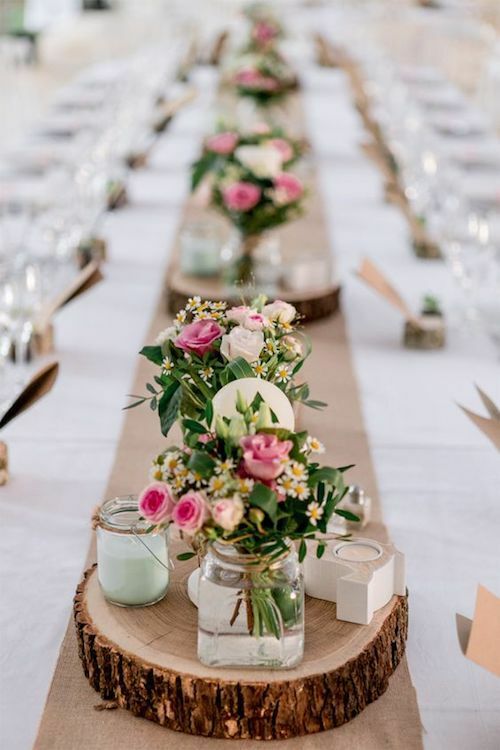 Wedding runners complement and decorate your table by mixing color and texture to make its aesthetic more cohesive and elegant. They can be used to achieve a traditional, glam, modern, colorful and even completely informal look. 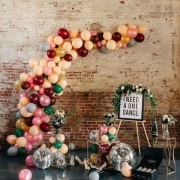 They are so on point, it would be cray if you didn’t use one at your wedding reception! There are three elements to consider when choosing a wedding table runner: color, texture and design. Its length depends on the formality of the event. Read on to find out more. 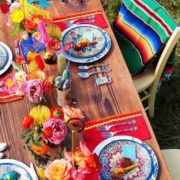 To achieve this look, make sure the tablecloth has at least a 6-inch drop off the table’s edge on all sides. This is way more aesthetically pleasing than a linen that stops right at the edge of the table. Measure the length and width of your tables, place and adjust the tablecloth. Table runner time! It needs to drop about 6″ to 15” off the edge and be one third of the table in width. Therefore, add at least 12“ to the full length of the table to get the proper measurements. 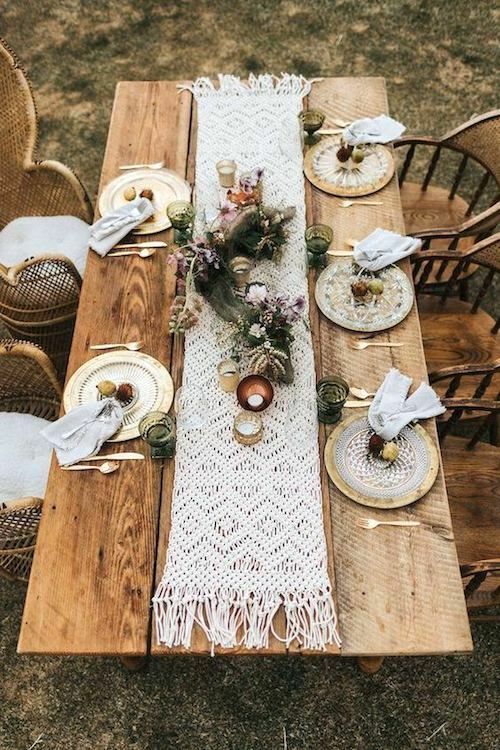 Boho table runner ideas for rustic wooden tables. Once we have the properly sized table runner, we center it over the tablecloth, and we place the centerpiece right in the middle. 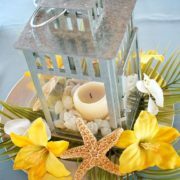 Additional decorations or centerpieces should be placed over the runner equidistant to the first one. 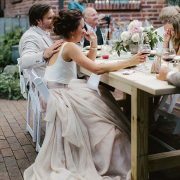 Fabrics that are smooth and shimmery such as silk, satin, organza and polyester are your best bets for traditional wedding tablescapes. 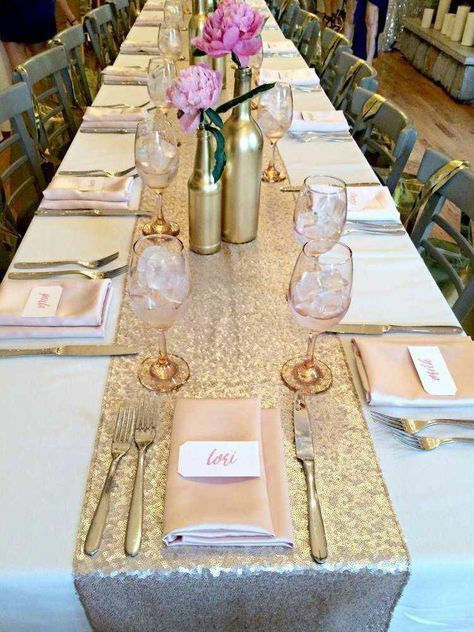 Pink chiffon table runners may also be tied with a ribbon for a more unique aesthetic. For a contemporary vibe that looks fabulous on very long tables, add 2 or 3 table runners across the table. Make sure they are perpendicular to the runner that extends along the table. These wedding runners should be narrower and have a drop of 6” off the table edges. Leave a distance of at least 2 feet between runners for a finished look. Another modern table runner idea is to do away with the main runner and use only the ones that run across the width of the table. This would leave a space in between them that could be used as place-setting areas. 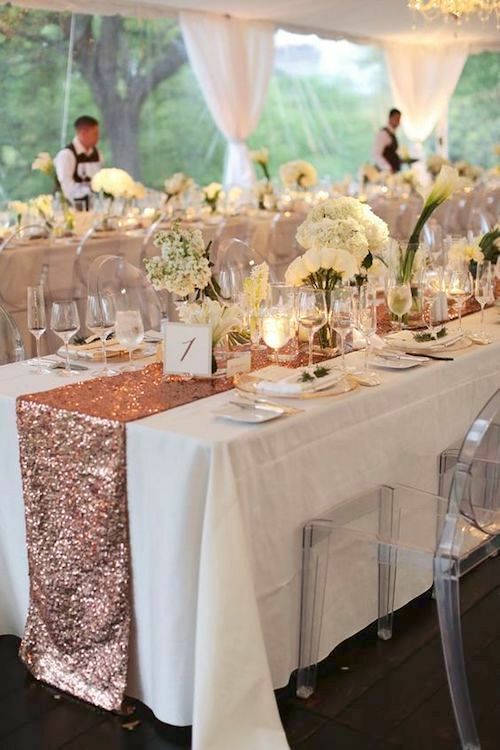 A rustic touch to a high end wedding table with a jute wedding runner by Jozie B.
Sequin table runners are a jaw dropping table accessory that resemble a work of art. Hadley’s Court. 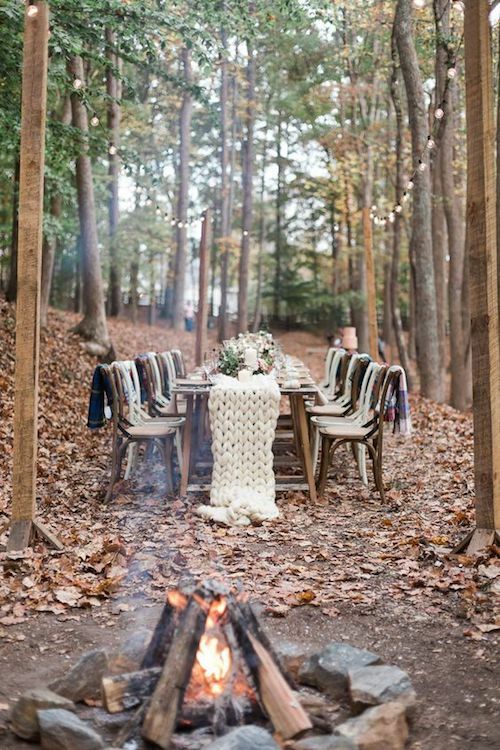 It would be a real shame to cover those beautiful wooden tables with linens. That’s where these table runner ideas come into play. Choose densely woven fabrics like linen or cotton for a classy and traditional feel. 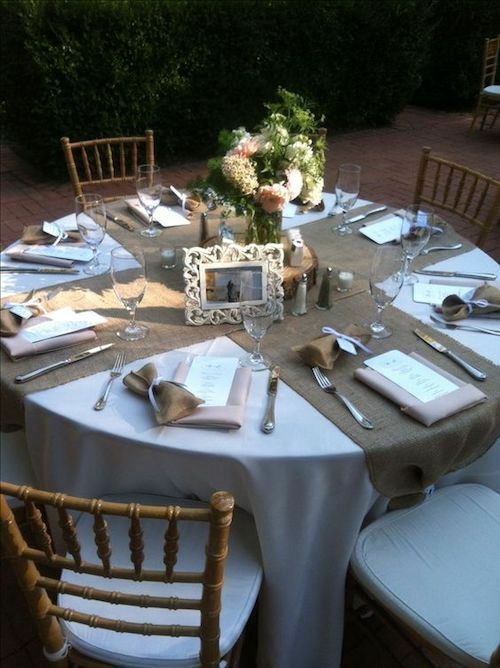 Burlap is inexpensive and goes well with a more rustic look. Sequins and shimmer are perfect for a glam aesthetic. And if you are looking for a more romantic style go with chiffon, lace or moss. It is truly beautiful! 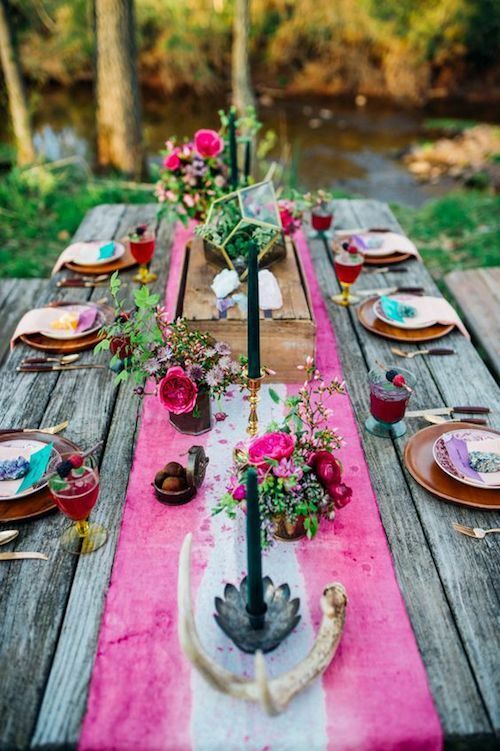 Colorful boho woodland wedding table runner ideas. The look includes antlers, moody colored candles and jewel tones for a Maryland wedding. Photo: Paula Bartosiewicz Photography. Swipe left to scroll through the photo gallery. Gold and navy wedding reception. 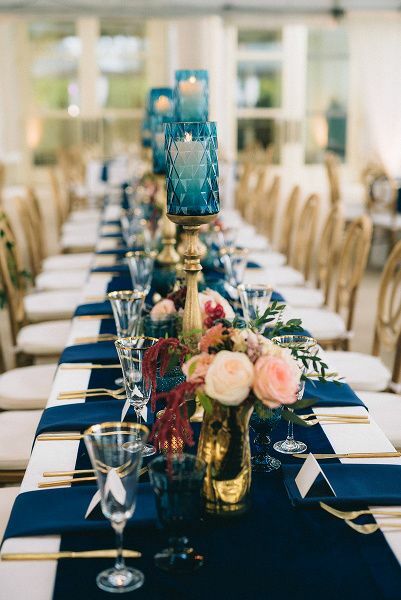 Sequins are on trend and this gold and navy wedding reception rocks them to perfection. 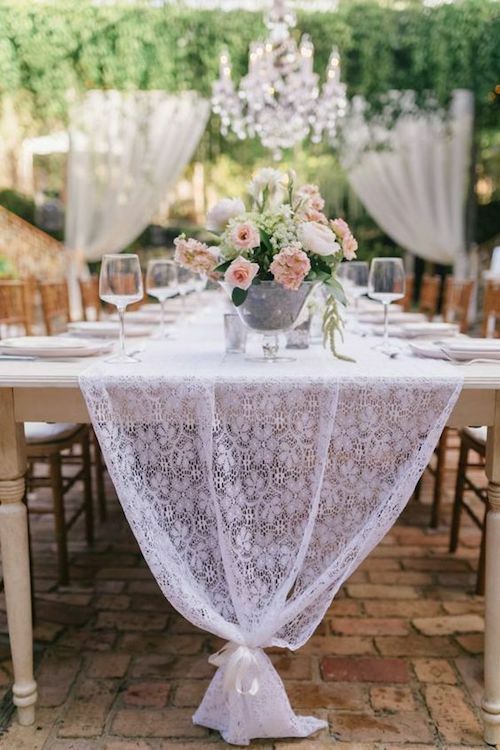 Long white lace table runners add a classy and delicate touch to your garden wedding table decor. Table runner with old family photos. How cool is this?! 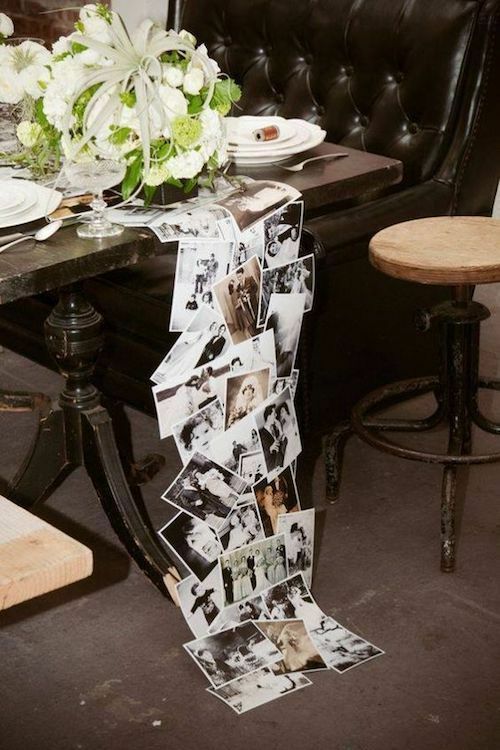 A table runner made out of old family photos. Make copies and laminate them so you don’t damage the originals. 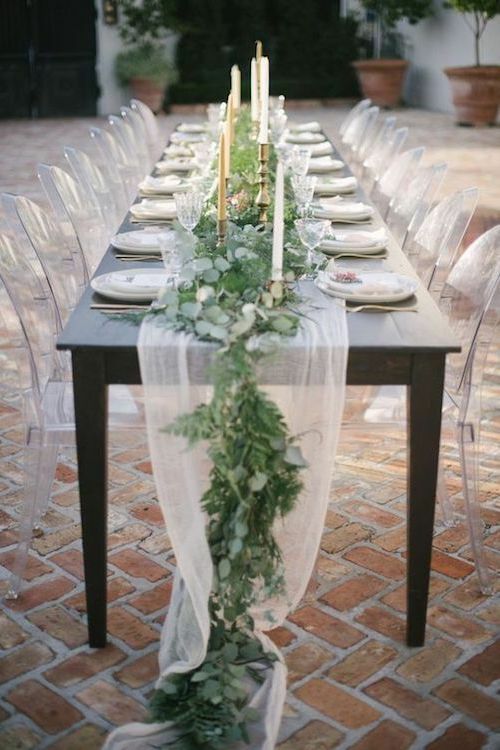 White, green and gold eucalyptus garland table runners that fall off the edge of table. Candles and Bonsai. Table runner ideas that raise the roof. 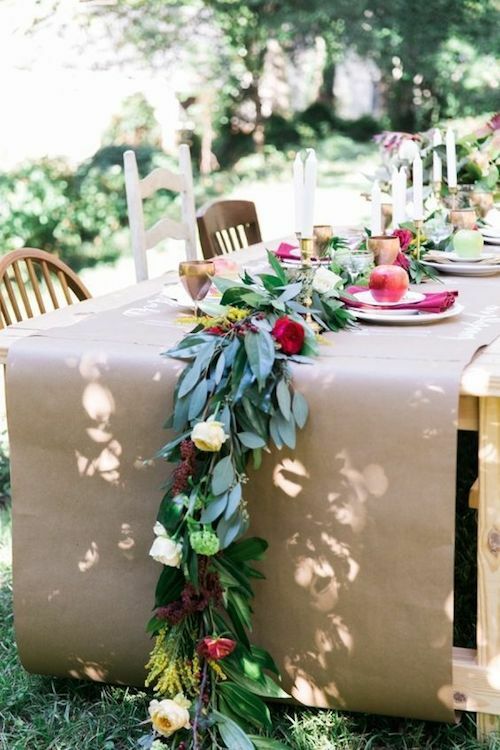 Super informal and chic table runner idea for an intimate outdoor wedding. Told you this idea would steal your heart!! Nothing more romantic than having the lyrics to “All Of Me” by John Legend written in calligraphy on your table runner. Image by Carrie J Photography. 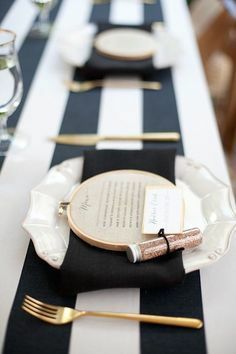 Short black and white striped table runner ideas for informal wedding receptions. Original table runner ideas for a round table. A perfect wedding runner for a vintage reception. Chiffon wedding table runner ideas. Chiffon is elegant and timeless and is the perfect pretty accent to any wedding. 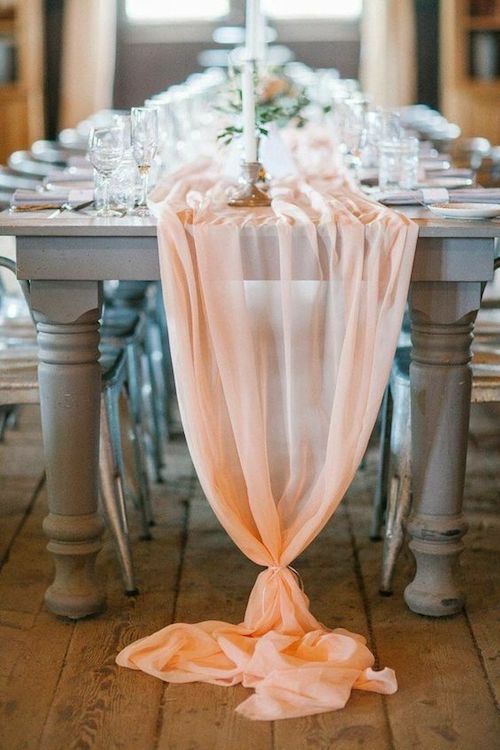 Whether it be a rustic, vintage or glamorous wedding, there are chiffon wedding table runner ideas for every style. Custom bronze runners, white linens and ghost chairs at the Four Seasons in Austin, TX. 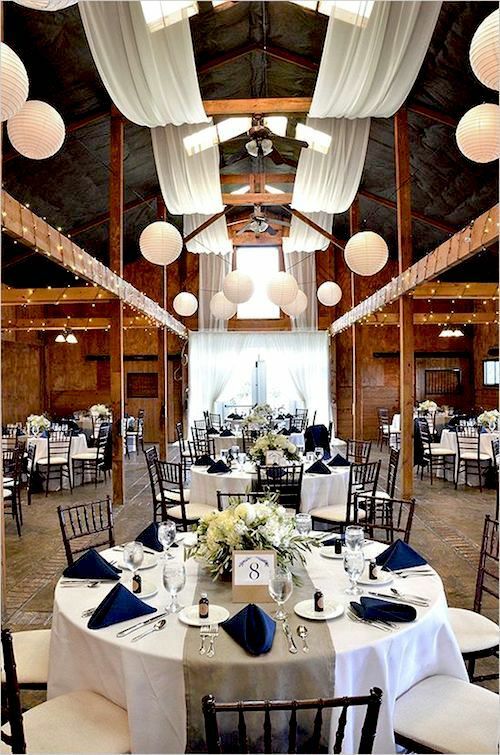 Runner garland over full linens. Lots of wow factor on this runner in bright purple and green garland over full linens. Wedding table runners will draw attention to your centerpieces at the reception. 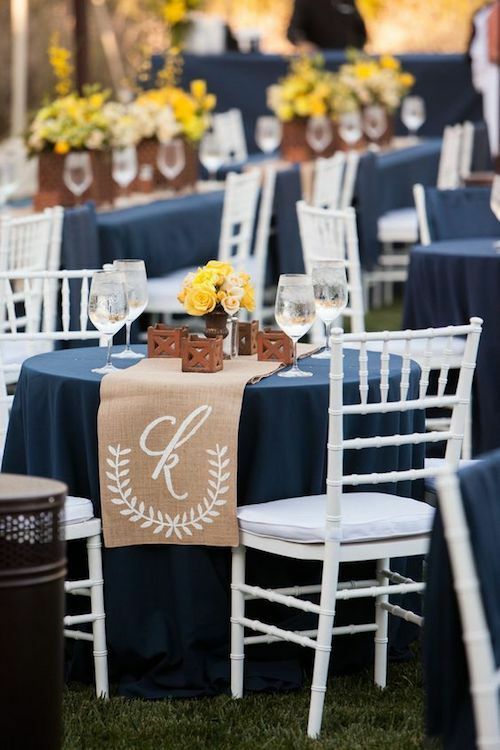 2018 monogrammed table runner ideas for round tables. Table runners are a great way of dressing up your tables and can really give your reception space that wow factor. 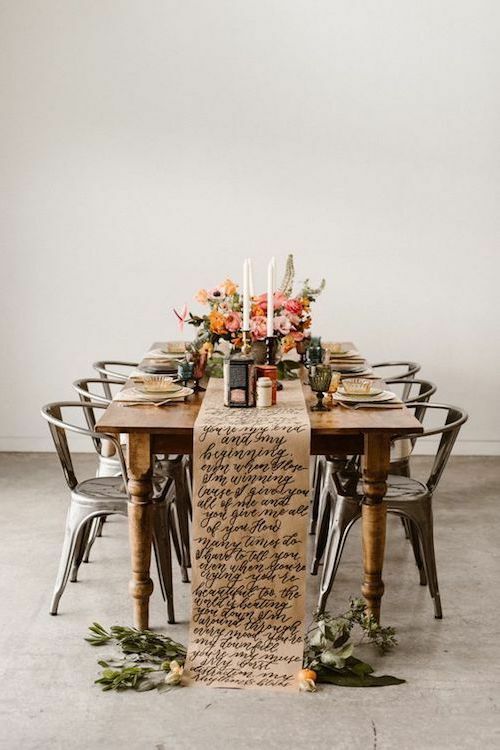 To shake off the formality of the long table runner, go short! Go no longer than one third of the table length and take advantage of textures and patterns to make it pop. Table runner ideas from winter Georgia woodland weddings. Photo: Carography Studios. 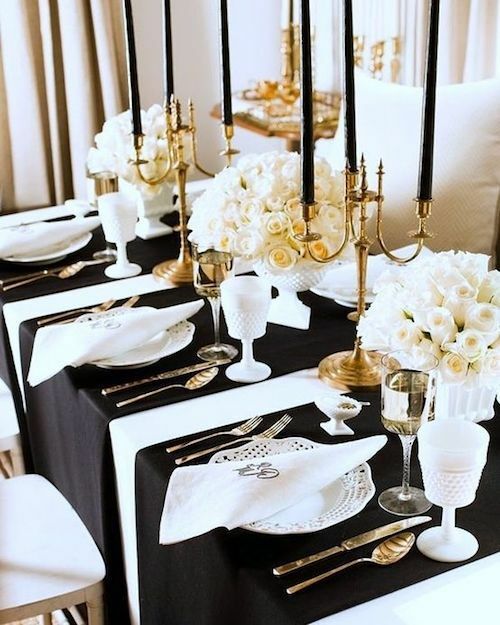 Informal table runner ideas with a very glam vibe. This all sounds great but your tables are round? Do not despair! We got some some tips for you. 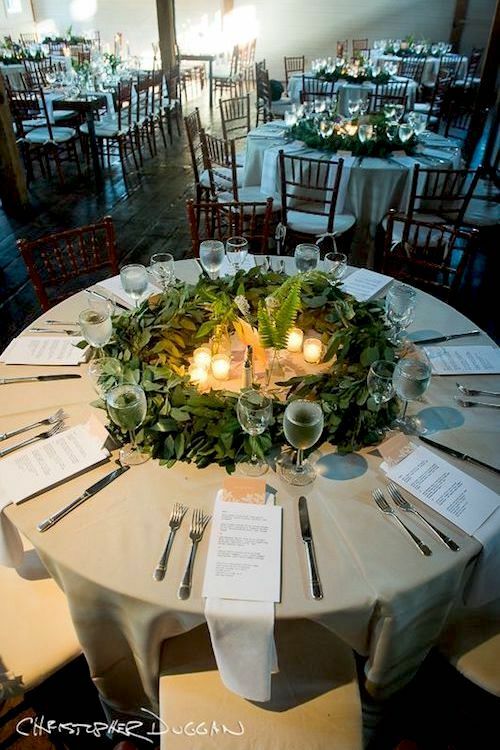 Place two table runners so that they form an x-shape over a round table for 8 people. There should be sufficient space for two people to sit in each section. This configuration creates intimate areas within a large table decoration. If the round table sits only six, you may want to use a single table runner. Even tough this is the standard way to lay out a runner for a round table, i would layout a couple that intersect and divide each table setting. Round table runner ideas. X marks the spot for the centerpiece. Table runners can add a modern luxury feel to your table setting. 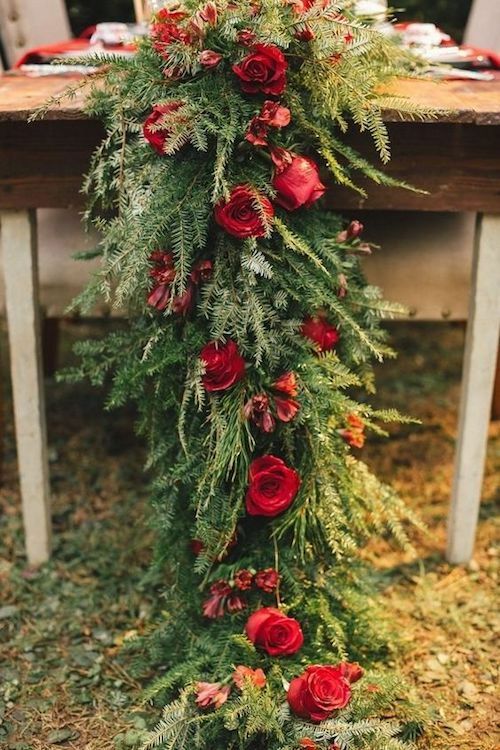 Gorgeous evergreen and red roses wedding table runner ideas. 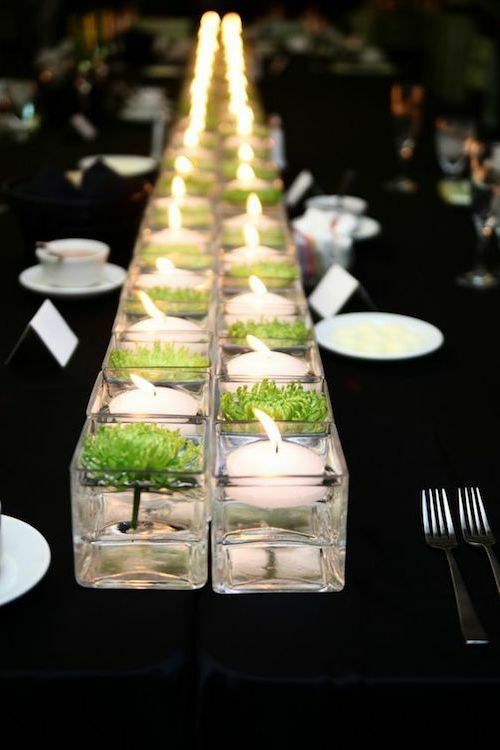 Forget the linens and go for this breathtaking table decor! Wedding table runners look their best when coordinated with the whole theme as they help direct attention towards the centerpieces and other table decor. But as with everything weddings, these table runner ideas and advice are just suggestions. Take them or leave them but let your personality shine through! Tell us which one you liked best! 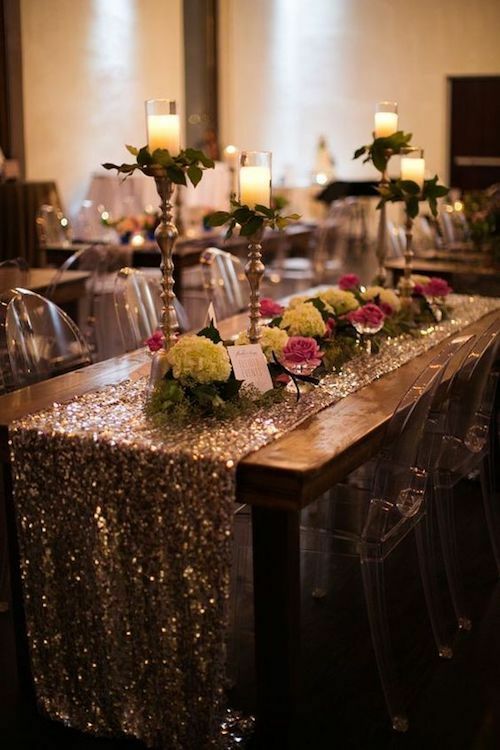 A beautiful sequin table runner shimmers with its own light. 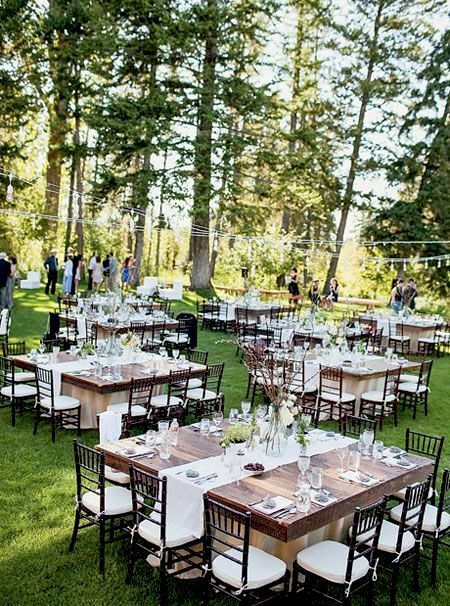 Fam friendly outdoor wedding at the Montana’s Rivers Edge Ranch with square tables. 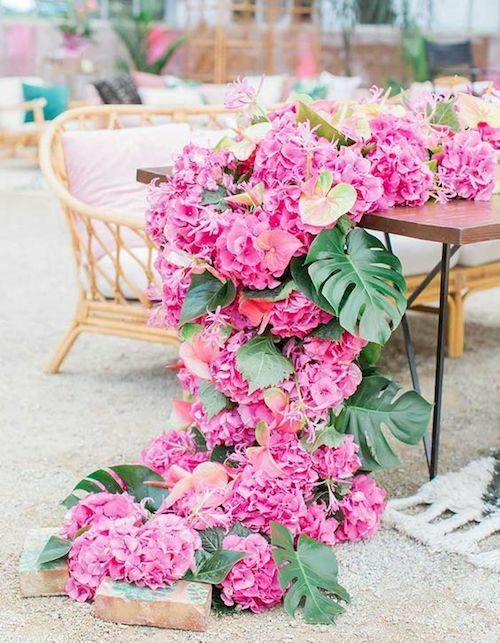 This tropical floral runner is guaranteed impress your guests. 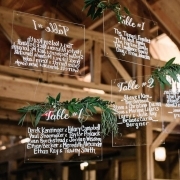 Destination table runner ideas. Photo Credits: moncheribridals, the perfect palette, wedding chicks, Brides, mywedding, the wedding guru, himisspuff, SMP. 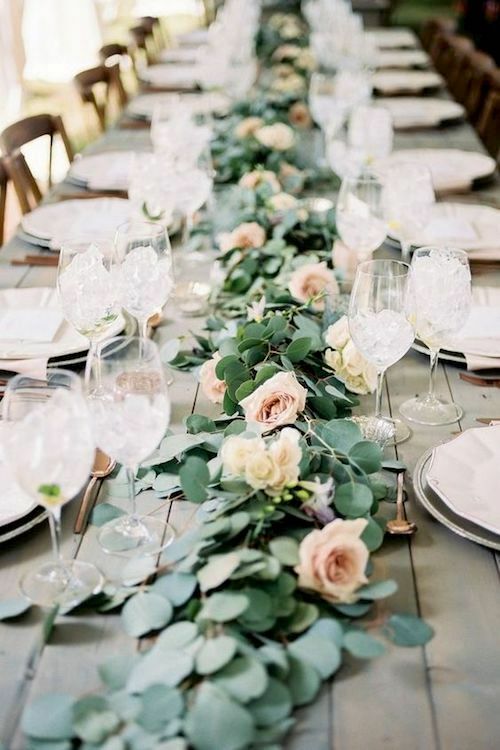 https://bodasyweddings.com/wp-content/uploads/2018/03/table-runners-modern.jpg 625 500 Bodas y Weddings - Patricia https://bodasyweddings.com/wp-content/uploads/2019/01/bodasyweddings-logo-byw.png Bodas y Weddings - Patricia2018-03-29 18:28:352018-05-08 18:35:0431 Fab Table Runner Ideas for Wedding Receptions: #7 Will Steal Your Heart!